Thanks for your interest in volunteering at our 2019 Haw River Festival! 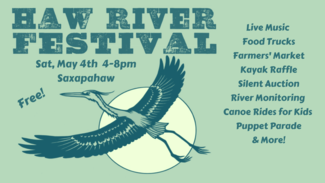 The festival is on Saturday, May 5th from 4pm-8pm in Saxapahaw! We need assistance starting with setup at 10am on the day of the festival through breakdown at 8pm that night! Volunteer slots are listed below, and email Erin Jobe at [email protected] if you have questions. if you have a truck and are willing to help us haul supplies back to Bynum - let us know!